Three-almost-four years old is a wonderful age. The world is much simpler. Wants are much fewer. The soles of Omaha's shoes were falling apart. He even showed the bottom of his shoes to IT Prof and me without prompting. The family went to Spin in Lenexa for lunch after church two Sundays ago. IT Prof and I offered to buy Omaha new shoes as an early birthday present, and we drove north to Legends and the Stride Rite outlet store. Of course, boring old Grandma looks at the shoes and sees the velcro fasteners. Omaha looks at the shoes and sees the coolest pair of shoes in the universe. One look at his face, and it was obvious that (to Omaha) it did not matter whether the shoes fit, whether the shoes were comfortable, nor whether the shoes were sturdy. In his mind, Omaha was already leaving the store with those shoes on his feet. Fortunately, the pair on his feet fit. Omaha walked around the store showing the-not-quite-his shoes off almost exactly like a booby courting on the Galapagos Islands. 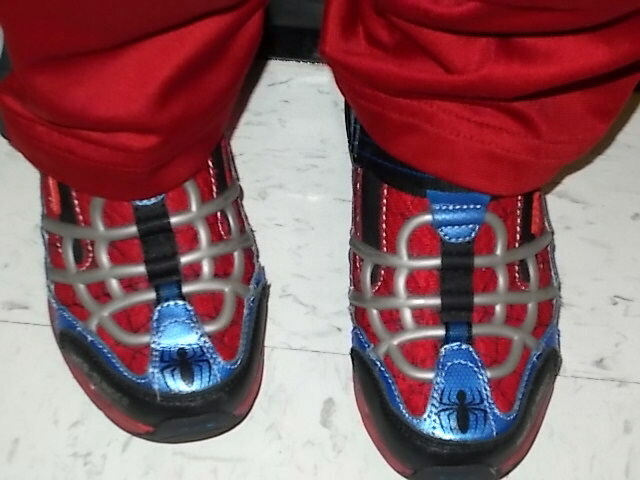 Of course, Grandma and Grandpa bought the Spiderman shoes as the early birthday present. Even more predictably, Omaha left the Stride Rite outlet store wearing his fine new shoes.